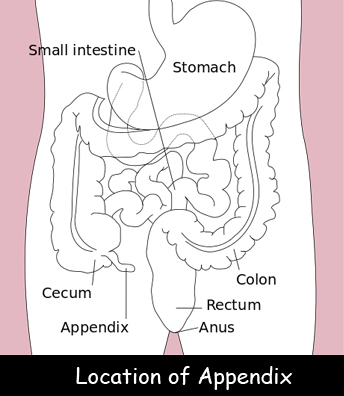 The appendix is a small thin tube where your small intestine meets your large intestine. It’s on the right side of your body. For a long time, doctors thought the appendix served no purpose in the body. Now researchers wonder if the appendix might be a place where helpful bacteria lives. Appendicitis is a painful condition that happens when the appendix becomes inflamed. Appendicitis is pretty rare. About 5 percent of people will have appendicitis during their lifetime. This problem is most common between the ages of 10 and 30. Boys are more likely to have appendicitis than girls. The symptoms of appendicitis may seem like indigestion at first. People sometimes feel nauseous or have diarrhea. They might vomit or have a fever. The pain gets worse over time and usually occurs near the belly button or on the lower right side of the belly. Appendicitis needs to be treated right away. If the appendix bursts, it can cause a serious infection. The treatment for appendicitis is a surgery called an appendectomy. A doctor will make a small incision and remove the appendix. In some cases, the doctor can use a type of surgery called laparoscopy, which is a simpler surgery. After surgery, most people stay in the hospital for a few days. Answer: Sometimes it happens for no obvious reason. Or it can happen because something is blocking the appendix, such as worms, poop, a tumor, or trauma. Find out more about appendicitis in kids. Declan, Tobin. " What is Appendicitis? Facts for Kids ." Easy Science for Kids, Apr 2019. Web. 23 Apr 2019. < https://easyscienceforkids.com/appendicitis/ >.